This article originally appeared in the summer 2017 issue of The Twig, our 24-page member newsletter. To read more from this issue, click here. To become a member and receive The Twig in the mail, donate online. I’ve been a musician and choral singer since I was five years old. I was trained classically, and performed a lot of religious music for audiences who sat still and listened politely. Over the years, I would run into pieces that felt different, but I didn’t know why. I finally put it all together when I moved to Bloomington in 2009 and discovered Malcolm Dalglish, a local composer with international renown. I realized that all these songs I loved were written by the same quirky person. In a word, Malcolm’s music is grounded. The lyrics and the very notes themselves are in touch with nature, but they’re also rooted in the spirit of musicians who came before him. “I like to compose songs in the style of a people rather than a person,” he explains. Many composers aim to be like the greats – Beethoven, Mozart, Bach – while Malcolm seeks influence from different cultures and traditions. He also stresses that the music must reflect and enhance the meaning of the text, rather than obscure it. His song “Great Trees,” which is one of my absolute favorites, was written on a chilly winter’s night when the power went out and he sat near the fireplace. To me, the piece sounds folky, almost like a hymn, and it’s a true joy to sing. You can hear a recording of Voces Novae, the Bloomington chamber choir that I sing with, performing “Great Trees” at sycamorelandtrust.org/twig. Malcolm’s music runs the gamut from a capella choral pieces to funny folk songs with dance movements and mouth music. You might hear his self-built hammer dulcimer, various percussion instruments, and improvisations. All this comes to play in his off-the-grid Ooolation Singing camp on the doorstep of Yosemite and in performances at National Parks and concert halls around the world. Southern Indiana is lucky to have a musician like Malcolm in our midst, but he feels equally fortunate to live here. He describes the beauty of our natural world, like Sycamore’s Amy Weingartner Branigin Peninsula Preserve. 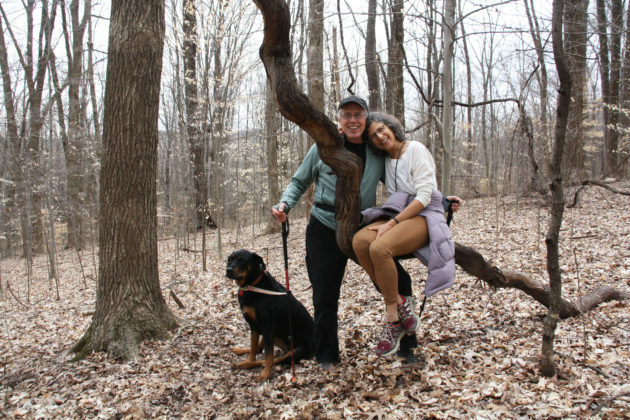 “To be able to walk along a ridgetop that has sky above you and sky beneath reflected off a lake – it’s visually stunning,” he says of the trail, which he visits with his wife Judy Klein and their dog Lola. “There’s shale walls and limestone outcroppings, beaches with geodes, bird migration above, and distant vistas of forested hills.” He tries to get out in the woods for at least an hour every day. And he appreciates Sycamore’s tireless efforts to protect natural places like this.